Seats 14 Passenger plus luggage. This 2016 Luxury Mini Bus & Driver is the ultimate in Ground Transportation for comfort and luxury. This bus has a lot, so here we go: 14 Level 4 seats, Sirius / XM Radio, AM/FM/DVD/PA input with (7) speakers (6) ASA, 15″ Wedge Mount Monitors and (1) ASA 22″ LED flat screen in front. (15) USB Dual Chargers Sockets on back of seats, Overhead luggage racks, upgrade LED reading lights, 30 17.5″ high back double recliner seats with Lap belts + 5 non reclining last row. All seats have map pockets. the windows are Full glossy black out for ultimate protection from the outside heat. black vinyl ceiling and side walls and Tarabus custom vinyl wood flooring. 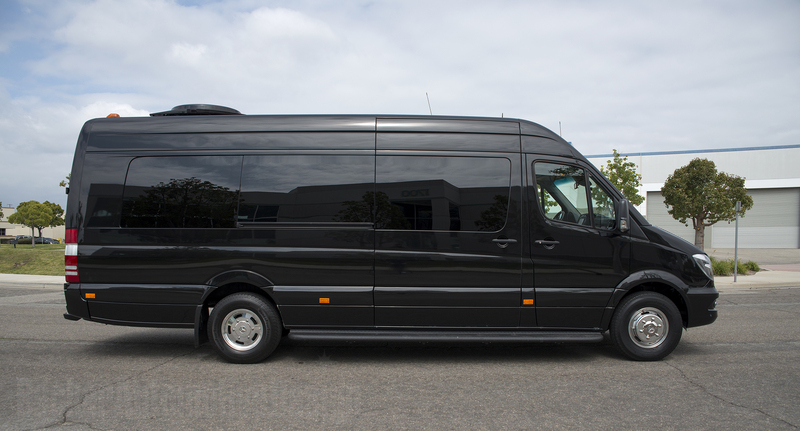 This 14 Passenger 2016 Luxury Mini Bus & Driver + luggage is the ultimate in Ground Transportation for comfort and luxury. This bus has a lot, so here we go: 14 Level 4 seats, Sirius / XM Radio, AM/FM/DVD/PA input with (7) speakers (6) ASA, 15″ Wedge Mount Monitors and (1) ASA 22″ LED flat screen in front. (15) USB Dual Chargers Sockets on back of seats, Overhead luggage racks, upgrade LED reading lights, 30 17.5″ high back double recliner seats with Lap belts + 5 non reclining last row. All seats have map pockets. the windows are Full glossy black out for ultimate protection from the outside heat. black vinyl ceiling and side walls and Tarabus custom vinyl wood flooring. We even have an extra long cord on the MIC for guided tours. Additional large Luggage compartment in the rear will keep all your bags safely in the back of the bus separated from the passenger compartment with a safety wall.